Don't drink just any tea, drink a tea inspired by your neighborhood! Do you love tea? Do you love Bushwick? How about Bushwick Tea? A new organic whole-leaf tea company took its name after our beloved neighborhood. While we haven’t tried the tea yet, the way Bushwick Tea looks speaks very much to our visually attuned souls. Bushwick Tea is a brainchild of Ratesh Chopra who moved to New York from London 20 years ago, and landed directly in Bushwick. “My first plunge into life here was in a small shared apartment in Bushwick. It was pretty intimidating, but I also enjoyed how raw it was living there,” Ratesh tells Bushwick Daily. Ratesh tells us that he has long moved out of Bushwick, but chose the name of the neighborhood for his tea brand because it was Bushwick where he got his start. “[I] named the brand after the neighborhood because that's where I got some of my inspiration from. And from starting out there (in Bushwick and on an even larger scale AMERICA) to starting out in the tea business requires raw grit and tenacity - hence the goat symbol on the brand, which always reminds me to carry on,” he explains. For the spring and summer season, Bushwick Tea is preparing five new iced-tea varieties. An exciting future plan Ratesh has been working towards is opening of a small retail shop in Bushwick for hot tea, iced-tea and kombucha and a tea cupping space that will serve as an intro to new Bushwick Tea flavors. If you simply must try this eye candy among teas, order a cup of hot goodness next time you’re at Montana Trail House, which serves six Bushwick Tea varieties. Ratesh tells us that his brand has been gaining traction also at co-working spaces and hotels. If you must have Bushwick Tea at your disposal ASAP, the shipping on all orders made through his website is free. 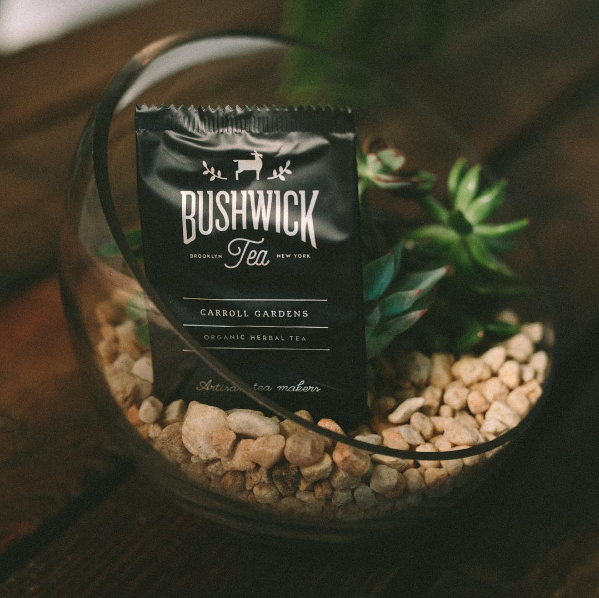 Update: Any Bushwick Daily reader can now use code BUSHDAILY10 at the checkout for a 10 percent discount on any Bushwick Tea. Score!